Collection and pumping of waste water and sewage from buildings and surfaces below the backflow level (to DIN 1986/EN 12050). The packaged Plastic sump pump station can be installed underground outdoors without requiring any concrete work. A time-saving easily installed and inexpensive solution for all planners and builders. Fully packaged self contained unit suitable for use in pressure drainage and as a drainage collector pump station. TS 40 - Slightly soiled fluids, 10 mm free spherical passage. TP 50 - For heavily sludges fluids; 48 mm free spherical passage. TP 65 - For heavily sludges fluids; 48 mm free spherical passage. 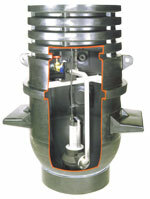 TP 80 - Heavily sludged fluids and sewage; 80 mm free spherical passage. Additional Options including 24 hours storage are available on Application. Discharge connection 1 ½" 1 ½" 2" 2 ½" 1 ½" 2" 2" 2 ½" 2 ½" DN80 1 ½" 1 ½"
Cast iron checkvalve 1 ½" 1 ½" 2" 2 ½" 1 ½" 2" 2" 2 ½" 2 ½" DN80 1 ½" 1 ½"
Gate valve material 1 ½"